The first weekend in October means Thanksgiving weekend to most Canadians, but to Canadian poker players, it also means it's time for the Saskatchewan Indian Gaming Authority (SIGA) Poker Championship. The premier event on the SIGA poker calendar every year, the Championship is held at Dakota Dunes Casino on the historic Whitecap First Nation, just south of Saskatoon. This year, Daniel Lefebvre was the big winner, taking down the title, the top prize, the bracelet, and the WSOP Main Event seat. Beginning in 2011, the year marks the seventh running of the Championship. Last year, increased attendance forced the tournament to expand to a second day 1, and over the two day 1s, 380 entries were recorded. Local Saskatoon grinder Trevor Norlander was the player sitting with all the chips at the end in 2017, and while he was back to take a stab at the repeat this year, he failed to find a bag in either Day 1. Instead, it was another past champion who looked like he might repeat for the title. Chris Bowers scored his first major win in 2014 at the SIGA Poker Championship, and he built up the biggest stack of the tournament coming into Day 2. Ultimately, Bowers fell in 23rd place, for a score of $2,066 meaning once again there would be a brand new champion in 2018. Joe Bohl came out of Day 1a as the chip leader, and quickly took over top spot on Day 2 as well. He managed to parlay that into the biggest stack going into the final table, but couldn't hold on from there, and finished in seventh place for $5,682. The big story of the day, of course, was Lefebvre, who came into Day 2 with the third-biggest stack. He played his cards well, and hit his hands when he had to, and by the time he hit the final table, he started to take over. He was responsible for busting six of the final 10 players, and went into three-handed play with twice as many chips as his opponents' combined, and held a nine-to-one chip lead over the runner-up, Troy Nisbet, in heads-up. After starting days of 134 and 232 entries, a total of 71 players made it through to Day 2. They played down to the money bubble pretty quickly, but the bubble took more than 90 minutes to finally burst. Once the bubble was past, the bustout bonanza picked up pace, and they were quickly down to 30 players, and had set the final table by shortly after 6 p.m.
Lefebvre came into the final table with the second-biggest stack, but then proceeded to bust most of the other players. Nisbet was the only player to stay mostly out of his way, and he was rewarded by making it to heads-up. But Lefebvre's chip lead was just too big to overcome and Nisbet had to settle for the runner-up prize of $27,375. 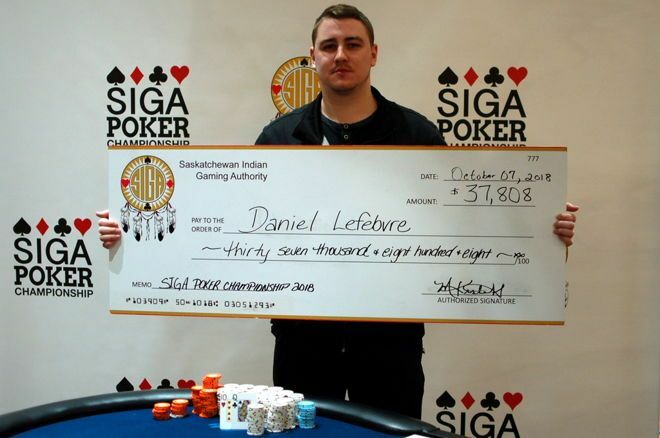 Lefebvre's win was worth $37,808 in cold hard cash, as well as the SIGA Poker Championship bracelet. As an added bonus, he also pocketed a free ticket to the 2019 World Series of Poker Main Event worth $13,000 Canadian. Below is a breakdown of the final table results.